The Home screen on your Galaxy Tab has two types of backgrounds, or wallpapers: traditional and live. A live wallpaper is animated. A not-so-live (traditional) wallpaper can be any image, such as a picture you’ve taken and stored in the Gallery app. 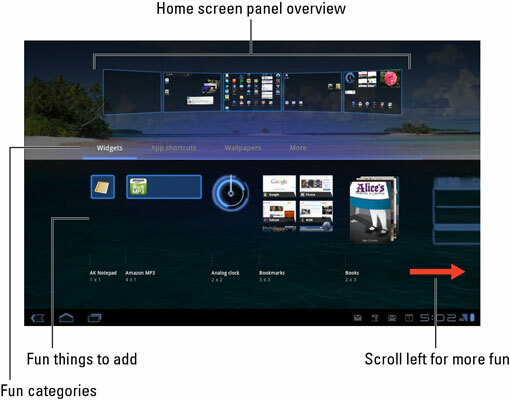 Touch the Customize button on the Home screen. The Add to Home Screen menu appears. Gallery: Choose a still image from those you’ve taken, stored in the Gallery app. Live Wallpapers: Choose an animated or interactive wallpaper from a list. Wallpapers: Choose a wallpaper from a range of images preinstalled on the Galaxy Tab. For the Gallery of Wallpapers item, choose whether you want the image to adorn the Home screen or the Lock screen. Live wallpapers can be applied only to the Home screen. Choose the wallpaper you want from the list. For the Gallery option, you see a preview of the wallpaper where you can select and crop part of the image. For certain live wallpapers, a Settings button may appear. The settings let you customize certain aspects of the interactive wallpaper. Touch the OK or Set Wallpaper button to confirm your selection. The new wallpaper takes over the Home screen or Lock screen. Live wallpaper features some form of animation, which can often be interactive. Otherwise, the wallpaper image scrolls slightly as you swipe from one Home screen panel to another. The Zedge app has some interesting wallpaper available. It’s an über-repository of wallpaper images, collected from Android users all over the world. Check out Zedge at the Android Market.